Use TB1KJK2 to reference this item. 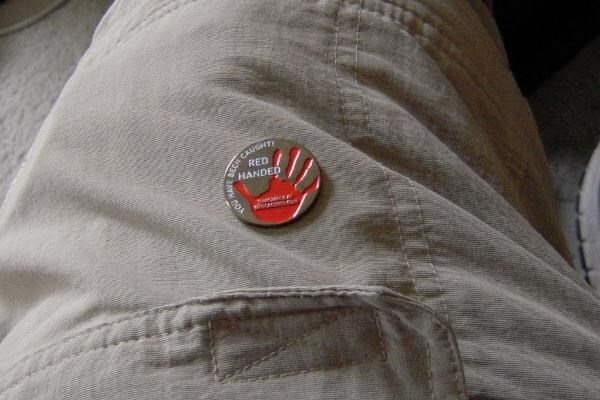 This Coin is traveling around to remind ALL RIDERS to Wear Gloves, this way if you have an accident, you might not end up Red Handed! It doesn't matter if you're on a Motorcycle, Bicycle, ATV, or whatever. Gloves with a reinforced palm can save your hands(and a lot of pain and recovery) if you end up on the ground. Found at Hutchy cache, nvr reported. Oops. Srry. Will move along. This is a message to let you know that your trackable item TB1KJK2 has been marked ‘missing’ by a cache owner or a site administrator. Trackable items are marked missing when it is determined that they are no longer located in the cache they are listed in or in the hands of the current holder. Please review the most recent logs on your trackable item to learn more information about its current state. This TB was not in Spring Hill Memorial Chloe Fry cache today. Please mark it missing. Found the coin today. Plan on getting it out of state within the next month. I'm enjoying this new geocoin and look forward to put it elsewhere. Alleslapp showed me your coin. Thank you for putting it out for us to enjoy. Grabbed this one from 7ofclubs. I was at his cache and he grabbed his traveler stash and we swapped coins and bugs. This was one I grabbed from him standing at his cache, The Wishing Well. Will get this one lots more miles very soon.